This cozy Old Mill 1 bedroom 1 bathroom cabin has lovely wooden interior walls throughout. The sleeper sofa is perfect for stretching out in front of the stone fireplace, and watching a movie, listening to the built in stereo, or just spending some quality time together. Enjoy the natural light that shines through the large windows above the sink in the fully equipped kitchen as you arrange a lovely meal. The bedroom has a king sized wrought iron bed, and an absolutely alluring stacked stone Jacuzzi, for those romantic evenings indoors. Take advantage of the rockers on your deck for sitting back and breathing in that fresh mountain air. Watch a movie or the game you have been waiting for while you soak in the bubbling hot tub on the screened in porch. This great rental is located LESS THAN ONE MILE from Sevierville Golf Club and WILDERNESS RESORTS Indoor/Outoor WATERPARK!!! Our Tennessee vacation was awesome! The cabin is more than what we expected. The cabin was very clean and pleasantly scented, it was hard to leave the cabin to explore the Smoky Mountains. The cabin was a vacation by itself. I would definitely recommend this cabin to my family and friends. We will have this on our list for another visit to the Smokies. We loved our stay at lovesong! The cabin is cute and cozy. It had everything we needed. We would definitely stay here again. We spent Halloween wknd in this cabin and we absolutely loved it! It was very clean and very comfortable! We felt right at home! We will definitely rent this cabin again in the future! My wife and I loved it. Jacuzzi. Hot Tub. Kitchen. Dishes. Dish washer. Full-sized Fridge. Speakers in every room and on the porch that you can plug up to an iPod or some other music device (which we did..often)! Speaking of the porch, both are pretty spacious. One has a nice swing, but the other is screened in and is perfect for relaxing. We’ll be staying there again soon (and that’s not just a sentiment; I’ve booked the dates). so glad that we stayed in this perfect cabin. Had everything we needed and far enough from the craziness of Pigeon Forge and Gatlinburg, but close enough to get there in minutes. No long dangerous winding roads to navigate at night, just 1/4 mile off the highway. Enjoyed the hot tub and king sized bed. The cabin was immaculately clean and well decorated. The kitchen is well equipped and the fireplace is a nice touch. It felt like home away from home. The homemade specialty soaps in the cabin are Very nice and I will be contacting the person who makes them to order some !!! 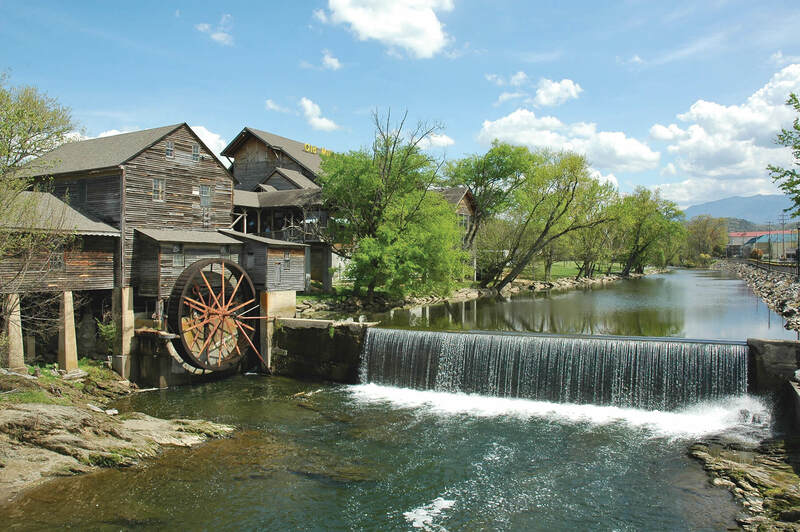 We will definitely stay here again as the staff at Old Mill Lodging was very helpful and easy to deal with and the cabin was so comfortable. Our cabin was well stocked with everything we needed. It was clean. Plenty of towels. Comfortable with a rustic appearance. Complete with extra blankets, iron& board . We had a great time. My wife and I loved our stay at love song this past weekend. The cabin was very clean had every thing we needed Kelli and all the staff was great to work with they will go out of their way to help you. This is our 4th stay at one of the Old Mill cabins or MT homes we will always stay with Old Mill and tell our friends to stay with them. This cabin is Excellent for 2 for a getaway. This cabin was wonderful and perfect for couples! Very clean, tastefully decorated, and all the conveniences you need to stay in if you choose. The hot tub on the secluded covered porch was so relaxing and a tv on the porch my husband could not have been happier! Lots of extra touches you don’t always find such as lighters, salt, coffee filters etc. we will definitely go back. We really enjoyed this cabin for our valentines weekend getaway. Everything was clean and very welcoming. The pictures show everything as it was in the cabin, there were no unwelcomed surprises! Since it was valentines day old mill even had chocolate covered strawberries on our doorstep which was a sweet surprise! The cabin is a bit off the main drag before pigeon forge & gatlinburg however, we loved it like that! We can’t wait to plan another trip down in this cabin! Everything was perfect!